Among Albanians, the city of Korça is famous for many things but, in particular, for its romantic serenades, traditional cobbled alleys and the Old Bazaar. Yet, despite their magic, there is much more to see if you decide to leave the center of the city and explore Korça’s spectacular periphery. Medieval art, alpinism and mountain tourism, beautiful lakes and plenty of other surprises await you just a few kilometers away from the city. Nature meets art and history in Voskopoja, making it a favorite destination for tourists year-round. The town of Voskopoja is renowned for having been a cultural center since 1330 and, over the centuries, more than 24 churches were built there. The city hosted the first printing press outside Istanbul along other important institutions, such as the New Academy. Unfortunately, many of these buildings were eventually destroyed by fires, wars, robberies or earthquakes. From that glorious past, now the visitor may admire The Monastery of St. John the Baptist (Manastiri i Shën Prodhromit), the Church of St. Mary (Kisha e Shën Marisë), the Church of Saint Athanasius (Kisha e Shën Athanasit), the Church of Saint Nicholas (Kisha e Shën Kollit), among other churches or buildings which are now considered culturally, historically or aesthetically significant. 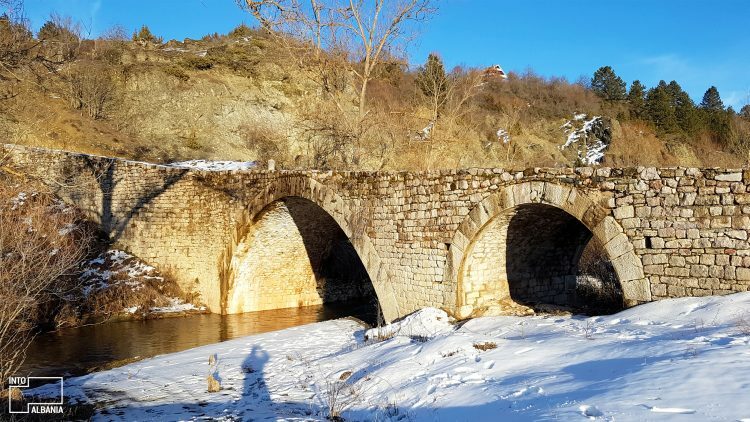 Located only 21 km (13 miles) away from Korça, Voskopoja is surrounded by hills and forests and, with its altitude of 1160 meters above the sea, this area is a favorite spot for winter sports such as skiing and snowboarding. Here, you’ll find hotels of the highest standards and traditional restaurants which serve the famous cuisine of the region, all making your stay unforgettable. For the map, click here. Thanks to its position at 1344 meters above sea level and surrounded by mountains and forests, Dardha is the perfect vacation spot for all seasons. 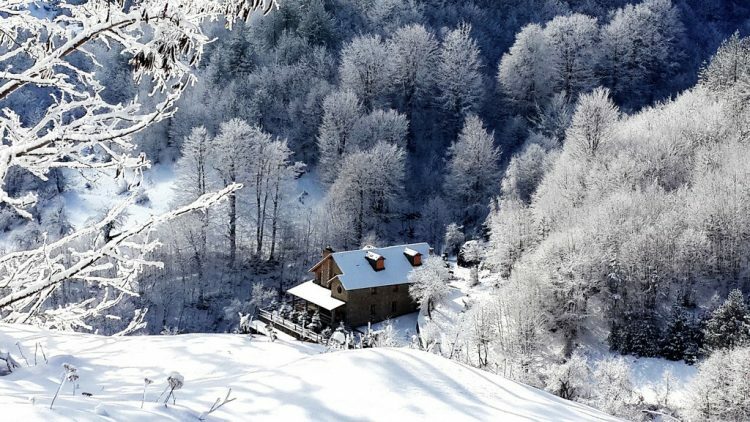 Its extremely clean air revives both body and soul and, during the winter, the green forests and houses made of stone are all covered in snow, granting the place a fairy-tale appearance. This 300-year old village is a cozy place that looks and feels like home. And, like Voskopoja, Dardha is also a skiing resort (click here for more). For the map, click here. The National Park of Prespa, one of the biggest and most impressive natural parks in Albania, is only a 20-minute car ride away from Korça. 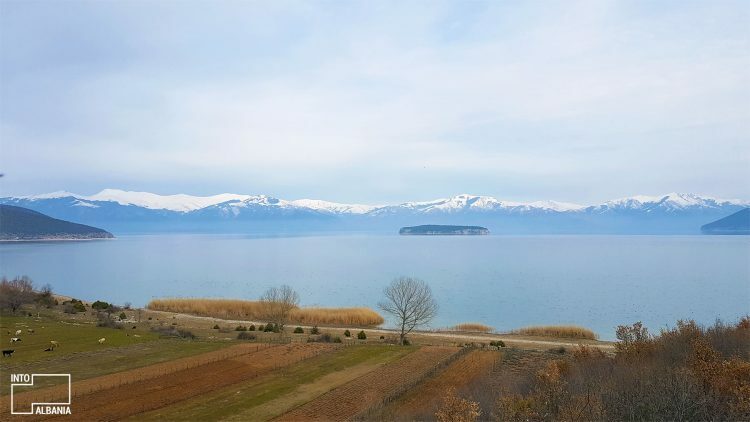 As the two wonderful lakes of Prespa e Madhe (the Greater Prespa Lake) and Prespa e Vogël (the Small Prespa Lake) have kept each other company for over 5 million years, perhaps the time has come for you to visit them as well. With a surface area of approximately 300 square kilometers and a maximum depth of 54 meters, the Great Prespa Lake is shared between Albania, Greece and Macedonia, and is well-known for its fresh waters and sandy beaches. The real protagonist of the Great Prespa Lake is undoubtedly Island of Maligrad, a place that is uniquely attractive mainly because of its sloping limestone. The island’s namesake, Maligrad, means small city in Macedonian. For those who wish to visit the island, there is a pleasant surprise waiting for you: the Church of St. Mary! Built in 1369 inside a cave that was considered a holy place, the small church will immerse the visitor in its peaceful and spiritual atmosphere. On the western side of the lake, near the villages of Treni and Devoll, the Cave of Treni is a must see! There, you will have the rare chance of admiring prehistoric paintings which date back to 6,000 BC. 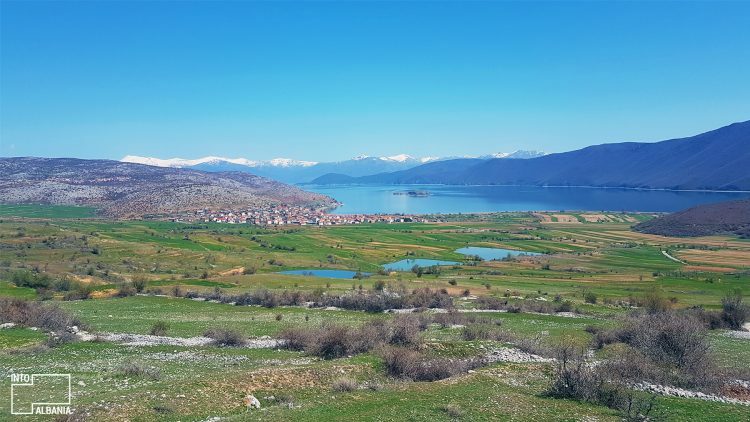 How to visit Prespa: through the Korçë – Gorica border crossing point, or Korçë-Bilisht. For the map of Prespa, click here. In the Middle Ages, Boboshtica was a well-known economic and cultural medieval center. From over 13 churches and monasteries which were built during the centuries, only three of them remain in good condition today: the Church of St. John (originally built in the 12th century and rebuilt in the 15th century), the Church of St. Mary (built in the 17th -18th century), and the Church of St. Dimitry, built in the 17th century. The scenic landscape of the village, particularly its old mulberry trees, make this area an aesthetically-pleasing and calming sight. In addition to being beautiful and especially great for one’s health, the mulberry trees are the source from which the famous rakija of mulberry is produced, the perfect souvenir to take home from Boboshtica. This raki is one of the best-tasting and strongest liquors In Albania and enough of a reason to visit the village. Boboshtica is also famous for its restaurants which serve some of the best and most traditional Albanian dishes like lakror, cheese crepes, roasted lamb and so much more. For the map click here. Similar to Voskopoja and Boboshtica, Vithkuq metamorphosed from a developed city during the Middle Ages to a quiet and peaceful village. To fully experience the ancient tradition of Albanian hospitality, no other place compares to Vithkuq, where the doors to every house are opened to all tourists who may want to stay there. The guests are served delicious food, prepared with fresh village products. From the 14 churches that have been preserved throughout the centuries, 6 of them are in great condition, especially the Church of St. Michael. This church was built in 1728 and today is the biggest church in the village, with a spectacular colonnade and beautiful frescos. 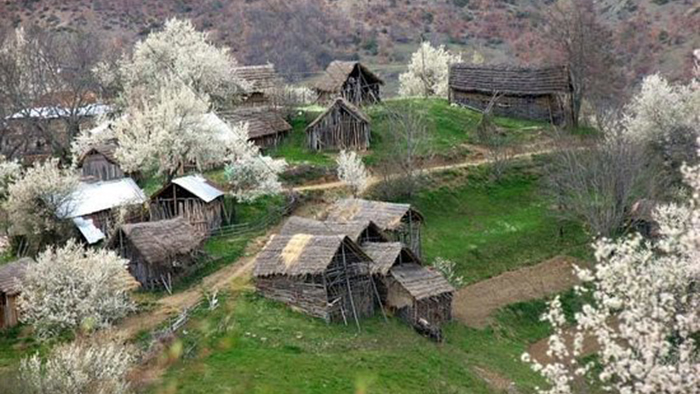 This village is also the birthplace of Naum Veqilharxhi, the creator of ‘Evetar’, the first Albanian children’s elementary book in 1844. For the map, click here. This mountain with a height of 2042 meters (Badarosh Peak) is full of things to see, so make sure to include it in your agenda once you are in Korça. 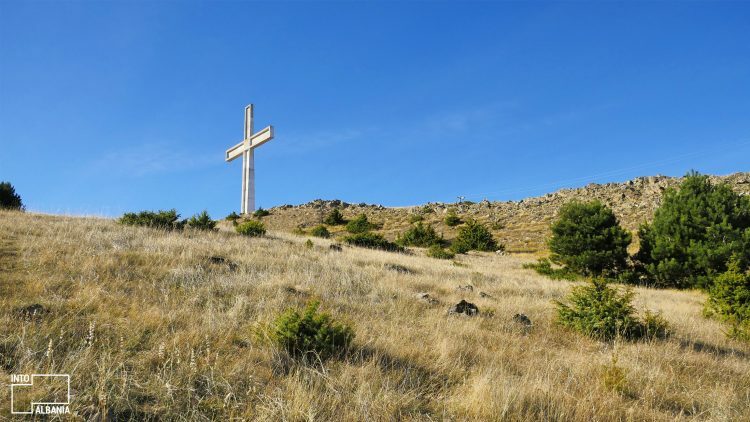 A big white Cross at the top of the mountain serves as a guiding post for all tourists who want to climb the Morava Mountain. Near the Cross, you’ll find the Church of St. Elias with its breathtaking view of the horizon, a place which is loved and travelled by both locals and hikers. 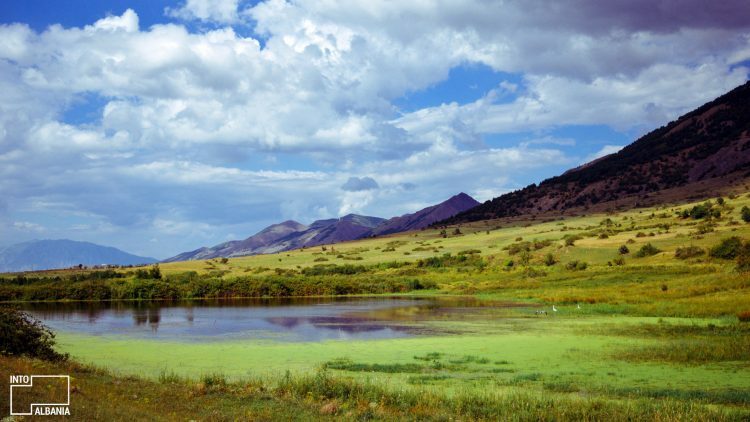 While in Morava you should not miss the Fir of Drenovë National Park and its breathtaking landscapes. For the map of Morava and Fir of Drenovë National Park, click here. For our extended article about the Morava Mountain click here.